This is a spice blend that I use most often in Beef Soup Provencal. It is also very tasty rubbed on a pork tenderloin and then roasted in the oven. What makes this blend different from some Herbes de Provence that you find at the store is the inclusion of the dried lavender. A mixture of lots of different herbs. The inclusion of dried lavender and fennel is especially unique. I use lavender from my summer harvest. Mix all spices in a small bowl. Store in an airtight container for up to 6 months. Another recipe for you today from the 89th birthday party. This one is a good breakfast or brunch or appetizer option, and I am sure you could add other toppings to these moist little crustless quiches. The ricotta cheese is what makes this recipe different, and I like the change in texture that it gives. These are also nice because they are easy to make ahead and reheat for serving. (cut from the Dierbergs grocery store recipe magazine) Crustless quiche with sophisticated flavor... simple, yet elegant! Coat mini muffin cups with no-stick cooking spray; set aside. In medium bowl, combine ricotta cheese and eggs; stir to combine. Add spinach, cheddar cheese, Bisquick, sour cream, melted butter, and spices. Stir to combine. Using small cookie scoop, divide spinach mixture evenly among prepared muffin cups. Bake at 375 for 16-18 minutes or until golden brown. Cool in pans for 5 to 10 minutes. Loosen edges of tartlets from pan and carefully remove; cook completely on wire rack. Store in refrigerator. Warm in 350 degree oven for 7 to 10 minutes before serving. Cooked tartlets may be wrapped tightly and frozen for up to 1 month. Thaw overnight in refrigerator. If the name alone isn’t enough to make you take notice, the crazy list of ingredients is sure to get your attention. I first ate this several years ago at a party my sister threw and have saved the recipe ever since. 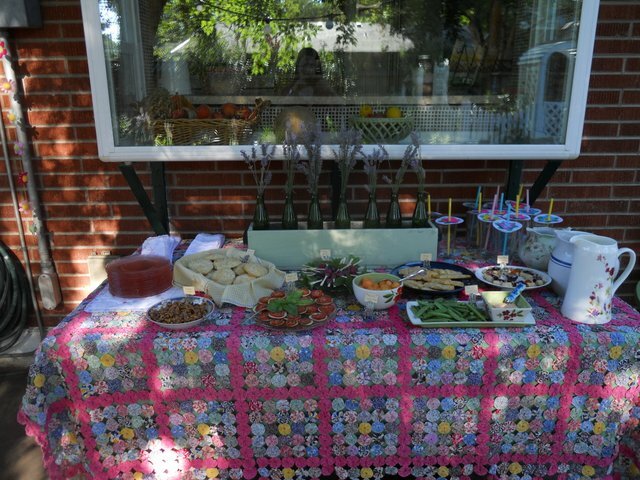 I finally had occasion to make it myself as part of the spread for Than’s grandmother’s 89th birthday, and it was a lively hit. The rich creaminess of the cheese, the kick of horseradish, the sweetness of the pineapple–it’s just a fun thing to eat! (clipped from a Dierbergs grocery store recipe magazine) This Southern appetizer's lively combination of creamy cheese, sweet pineapple, and a kick of horseradish, is sure to become one of your favorites. In work bowl of food processor fitted with steel knife blade, process cream cheese, goat cheese, and cheddar cheese until smooth. Shape into 2-inch diameter log; wrap in plastic wrap. Chill at least 2 hours or up to 3 days. In medium bowl, stir together pineapple topping, apricots, bell pepper, horseradish, and dry mustard until well mixed. Cover and chill for up to 3 days. Just before serving, roll cheese log in toasted pecans, pressing to adhere. Spread pineapple sauce on serving plate; place cheese log on top. Serve with wheat crackers.